Violence on our campus is the accumulation of individual decisions, moments, values, and actions made by all of us. It’s hard to know exactly how many violent acts are on our map at any given moment – but we do know there have been enough to create a culture that sustains unacceptable rates of power based personal violence against members of our community. Violence is not limited to women, but impacts members of our community of all genders and every race, background, sexual orientation, religious, or political persuasion, socioeconomic status and ability. C.R.E.W. (Community Response for Everyone’s Wellbeing) Bystander Intervention program provides important training to recognize and safely prevent situations of Power Based Personal Violence such as stalking, partner violence, sexual harassment, and sexual assault. 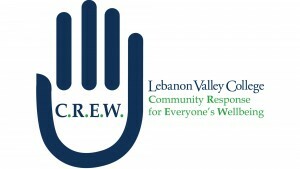 Please join us to become part of LVC’s C.R.E.W. – together we will work to make LVC safer and change the culture so that violence of any kind will not be tolerated. Anyone who is trained (either with Green Dot or C.R.E.W.) may choose to become part of our leadership team or train to become a trainer. Open Enrollment Training Sessions throughout the semester and Register on Redbook! Interested in you or your group being trained? Contact Brent Oberholtzer at oberholt@lvc.edu. Share your C.R.E.W. involvement on Facebook, Twitter or Instagram! Making Lebanon Valley College a violence-free community. To employ a bystander prevention program (Green Dot) as a tool to create a campus climate intolerant of power based personal violence (sexual assault, dating/domestic violence, stalking, etc.). To increase the efficacy of bystander behavior when confronted with power based personal violence. To convey the message that everyone in the community has a role to play in ending power based personal violence.